The demise of Pluna has left a large void in the Uruguayan market that will be partially filled through expansion by carriers from neighbouring Argentina, Brazil and Paraguay as well as by tiny Uruguayan regional carrier BQB Air. The Uruguayan Government has opted against bailing out Pluna, which ceased operations on 05-Jul-2012, and is instead now trying to find another carrier (either new or existing) to take over its routes and, potentially, its employees and fleet. But the end result will almost certainly be the the lack of a network carrier for Uruguay and the sale of Pluna’s 13 Bombardier CRJ900 regional jets to overseas buyers. While some of Pluna routes could be taken over by other carriers, there will almost certainly be a steep reduction in traffic at Montevideo’s Carrasco International Airport as the Uruguayan market is too small to support more than a handful of point-to-point routes. The demise of Pluna also has big implications for the small but fast-growing intra-regional international market within the Southern Cone region of South America. Pluna successfully carved itself a niche in this market with about 40% of its passenger traffic transiting in Uruguay to destinations in the other four Southern Cone countries of Argentina, Brazil, Chile and Paraguay. Pluna’s demise provides a dose of reality for smaller flag carriers that find themselves in a pond dominated by big fish like the new LAN-TAM parent company LATAM Airlines Group. LATAM and two other top 5 South American airline groups, Aerolineas Argentinas and Gol, are now poised to absorb a majority of Pluna’s approximately 1.5 million annual passengers, many of which will be redirected to hubs in Argentina and Brazil. Aerolineas Argentinas stated earlier this week it is interested in taking over Pluna’s flights between Uruguay and Argentina and is now working on a new increased schedule for the Buenos Aires-Montevideo route. Aerolineas in the wake of Pluna’s collapse became the largest carrier in Montevideo and now accounts for 16% of total capacity at the airport. 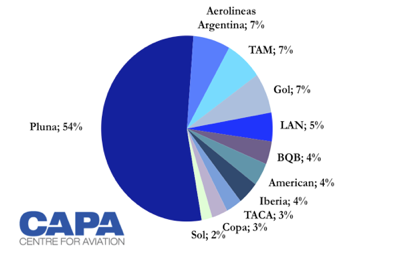 Prior to Pluna’s suspension of services Aerolineas accounted for 7% of total capacity while Pluna accounted for 54%. The total weekly seat capacity at Montevideo has dropped from about 72,000 to only approximately 33,000 as Pluna had provided about 39,000 seats to and from Uruguay's main airport. Aerolineas could see its share of total capacity in Montevideo grow to up to 40% if it takes over all of the capacity Pluna provided in the Buenos Aires-Montevideo market. But its market share in Montevideo is more likely to end up in the 20% to 30% range when factoring in the probable capacity increases in Montevideo by other carriers and the fact that Aerolineas will not likely take over all of Pluna’s capacity in the important Buenos Aires-Montevideo market. Buenos Aires’ downtown airport Aeroparque Jorge Newberry is by far the biggest route from Montevideo, accounting for about 25% of Montevideo’s total capacity prior to Pluna’s exit. Pluna provided about 5,400 weekly one-way seats from Montevideo to Aeroparque while Aerolineas currently only provides about 2,600 weekly-one way seats. Turboprop operators Sol and BQB also serve this route but only currently provide only about 600 and 200 weekly one-way seats respectively, according to the schedules provided on the two carriers’ websites. Aerolineas has said it plans to increase capacity on the Aeroparque-Montevideo route in phases, starting later this month. It has not yet indicated how many flight it aims to add but Aerolineas will likely expand capacity by up-gauging some of its existing flights on the route from Embraer E190s to Boeing 737s while also adding frequencies. According to Innovata data, Aerolineas currently offers 25 weekly flights between Aeroparque and Montevideo, but only six are flown with 737-700s while 19 are now flown with E190s operated by Aerolineas’ regional unit Austral. Pluna operated up to 10 flights per day between Aeroparque and Montevideo and also operated two daily flights between Buenos Aires’ main international airport Ezeiza and Montevideo. Aerolineas may now resume flights on the Buenos Aires Ezeiza-Montevideo route, which it served during its Southern Hemisphere summer schedule which ended in late Mar-2012. When factoring in both Buenos Aires airports, Pluna accounted for approximately two-thirds of all capacity in the Montevideo-Buenos Aires market. Aeroparque is primarily a domestic airport but has historically also been used for almost all flights to nearby Uruguay due the very short nature of flights from Buenos Aires to Montevideo and the Uruguayan beach resort of Punta del Este. Airlines compete in both these markets against buses and high-speed ferries, which take as little as three hours to plough from Buenos Aires to Montevideo or Punta del Este. Buses take longer as the land distance between the two capitals is significantly longer. Pluna’s slots at Aeroparque – which is also used for some international flights to Chile, Brazil and Paraguay – are considered valuable. Small Uruguayan regional carrier BQB Air will likely request to take over at least some of Pluna’s slots and traffic rights at Aeroparque. BQB was launched in 2010 and currently operates two ATR 72 turboprops on several routes connecting Uruguay with Argentina and Brazil as well as domestically in Uruguay. The demise of Pluna should open up opportunities for BQB to expand in the core Montevideo-Aeroparque route, where it currently only operates three weekly flights. BQB has always been interested in offering a regular service on the Montevideo-Aeroparque route to supplement the high-speed ferry services provided by its parent company Buquebus. But challenges with securing traffic rights and other authorisations has forced the carrier until now to focus on the Punta del Este market. Punta del Este-Aeroparque route is now BQB’s largest route with 19 weekly frequencies (Pluna also offered 12 weekly frequencies on this route with additional capacity provided in the peak summer season). Of BQB’s 13 routes, only Punta del Este-Aeroparque is currently served daily. Most of BQB’s routes cover small niche markets that are not served by other carriers. BQB only competed against Pluna on four of its 13 routes: Punta del Este to Buenos Aires and Montevideo to Buenos Aires, Florianapolis (Brazil) and Porto Alegre (Brazil). While BQB has said it is now planning to expand to fill some of the void left by Pluna, particularly in the Buenos Aires market, it is not likely to be willing to take over Pluna’s aircraft, employees or network carrier role. The Uruguayan government has unveiled plans to auction off Pluna’s CRJ900s, which is expected to take place within the next two months, and has said it will give preference to any bidder willing to also take on Pluna’s employees and routes. But BQB, which is already believed to have rejected the idea of acquiring Pluna prior to the carrier’s suspension, prefers to grow organically with additional ATR 72 turboprops and potentially 50-seat regional jets. BQB at least for now does not appear to have any ambitions to become nearly as big as Pluna or become a network carrier. It will likely initially expand its fleet to only four aircraft. While Aerolineas and BQB are both expected to soon announce additional flights at Montevideo, Gol so far has been the only carrier since Pluna’s suspension of services on 5-Jul-2012 to announce a new Montevideo route. Gol earlier this week unveiled plans to launch on 15-Aug-2012 one daily flight to Montevideo from its Sao Paulo Guarulhos hub. But Gol at least for now is not increasing total capacity at Montevideo as it will be eliminating one of its two daily flights from Porto Alegre to Montevideo when the new non-stop flight from Sao Paulo begins. Gol, which operates a fleet of Boeing 737-700/800s in all-economy configuration, has until now only offered service from Montevideo to Sao Paulo via Porto Alegre, where connections to other Brazilian cities are also available. As it is located in southern Brazil towards the Uruguayan border, Porto Alegre is only about 700km from Montevideo while Sao Paulo is about 1500km from Montevideo. The new non-stop flight from Sao Paulo to Montevideo will help Gol pick up some of the passengers previously carried by Pluna between Sao Paulo and Montevideo, particularly business travellers who value a non-stop product. Pluna operated four daily flights between Montevideo and Sao Paulo. TAM, which had a codeshare partnership with Pluna, is now the only carrier operating on this important business route. TAM currently operates two daily flights on the Montevideo-Sao Paulo route with Airbus A320s but will likely consider adding flights to fill the gap left by Pluna and counter the new flight from archrival Gol. TAM now accounts for about 15% of total capacity at Montevideo while Gol accounts for 14%, making the two Brazilian companies the second and third largest carriers currently serving the Uruguayan capital. TAM sister carrier LAN is now the fourth largest carrier at Montevideo with an 11% share of total capacity. LAN now operates two daily flights from Santiago to Montevideo, primarily using A319s. LAN will also likely look to add capacity in the Santiago-Montevideo market as Santiago was Pluna’s second largest destination after Buenos Aires with five daily flights and about 10,000 weekly seats. Argentina’s Sol and sister carrier Sol Paraguay also have expressed interest in expanding in Uruguay to fill some of the void left by Pluna. Argentina-based Sol, which operates Saab 340 turboprops, will likely join Aerolineas and BQB in adding capacity on the core Buenos Aires Aeroparque-Montevideo route. It could also look to launch services between Montevideo and Cordoba in western Argentina, a route which Pluna served with two daily flights but Aerolineas Argentinas is unlikely to pick up as Montevideo-Cordoba is a very small point-to-point market and most of Pluna’s passengers from Cordoba connected at Montevideo to destinations in Brazil. In addition to three daily flights to Montevideo from Buenos Aires Aeroparque, Sol now operates four weekly flights to Montevideo from Rosario, another regional centre in western Argentina. Sol is currently the smallest carrier serving Montevideo with only about a 5% share of total capacity. Sol Paraguay, which operates a small fleet of Fokker 100s, also has said it is looking at launching service to Montevideo from its Asuncion base. Pluna was the only operator in the Montevideo-Asuncion route and served the market with two daily flights. Pluna codeshared on Montevideo-Asunction with TAM’s Paraguayan sister carrier, TAM Paraguay. TAM Paraguay, which operates A320s, could also potentially launch service to Montevideo. But the smaller aircraft operated by Sol Paraguay is probably a better fit for this market given the relatively small point-to-point demand for Asuncion-Montevideo, a route that Pluna made work by relying heavily on transfer traffic. The other four carriers currently serving Montevideo – American, Copa, Iberia and TACA – are less likely to add capacity in Montevideo as they focus on medium and long-haul passengers from Uruguay while Pluna only operated short-haul routes. American, Copa and TACA all operate one daily flight to Montevideo from their Miami, Panama City and Lima hubs while Iberia offers five weekly flights from Madrid, according to Innovata data. Pluna previously operated to Madrid but dropped the route in favour of a codeshare with Iberia as part of a massive restructuring that was initiated after the carrier was partially privatised in 2007. Leadgate, a small investment firm led by a trio of Argentinean entrepreneurs, initially acquired a 75% stake in Pluna from the Uruguayan government for USD15 million and implemented a turnaround plan which led to the rapid phase-out of its mixed fleet of narrowbody and widebody aircraft in favour of a fleet consisting entirely of CRJ900s. With the new fleet of regional jets, Pluna began focusing entirely on short-haul routes of under three hours. Pluna’s network steadily grew, reaching 15 destinations, triple the size compared to pre-restructuring levels. Buoyed by a new transit business that focused on city pairs connecting Argentina, Brazil, Chile and Paraguay that are primarily under the radar screen of South America’s larger carriers, Pluna was also able to quintuple its total passenger traffic from the approximately 300,000 passengers per year it carried prior to the 2007 restructuring. Montevideo’s Carrasco International Airport prospered as Pluna expanded rapidly and as it opened a new modern terminal in late 2009 that improved the transit experience for Pluna passengers. A hybrid model was also adapted as Leadgate brought in several elements of the LCC model such a single fleet type in an all-economy configuration and a focus on ancillaries. For example, Pluna was the first carrier in the region to introduce fees for checked bags. As Pluna and Leadgate CEO Matias Campiani told CAPA and sister publication Airline Leader Magazine in an interview late last year, the carrier tried to offer fares that were “not the lowest but low enough to stimulate demand”. In a market with relatively high fares and very low LCC penetration levels, the strategy seemed valid. Pluna was able to stimulate some local O&D demand in the Uruguayan market but the real gains were in the broader Southern Cone market, particularly Brazil-Argentina and Brazil-Chile. After attempts to open routes to secondary cities in Argentina were repeatedly thwarted by Argentinean authorities, who have been keen to protect Aerolineas Argentinas since its renationalisation, Leadgate started to focus expansion on Brazil. The timing seemed impeccable as Brazil’s economy was booming and several of the country’s smaller international airports were under-served. Pluna’s Brazil network peaked last year at eight destinations. While only Sao Paulo, and possibly Rio de Janeiro and Porto Alegre, are thick enough from an O&D perspective to support regular service, Pluna discovered serving several of Brazil’s secondary cities was viable when considering the demand for travel between these cities and Argentina and Chile. Pluna continued to build up its Brazil network as its fleet steadily grew, reaching 13 aircraft in 2H2011. At the same time Pluna steadily added frequencies to most of its existing destinations. But the network suffered from some imbalance, with eight of its destinations in Brazil and only five in other countries: Santiago, both of Buenos Aires’ airports, Cordoba in Argentina and Asuncion in Paraguay. The missing component was additional destinations in Argentina. Several secondary cities in Argentina are under-served and had sufficient demand to support service to Montevideo given Pluna’s use of relatively small aircraft and strong network in Brazil. But Pluna’s attempts to get access to secondary destinations in Argentina such as Barliloche and Trelew were continually thwarted, even though Argentina and Uruguay supposedly enjoy open skies under the Fortaleza agreement. The Argentinean Government found several ways to deny and stall Pluna’s attempts to expand its network in Argentina. In repeatedly rejecting Pluna, the government made no excuses: it saw Pluna as a threat as it would take regional international traffic from Aerolineas Argentinas. The government seemed to care little about the economic benefit of service to Montevideo from Argentina’s regional cities and how much more convenient to passengers the Pluna product is compared to Aerolineas, which funnels all of its passengers from secondary cities to Buenos Aires where they connect onto international flights within the Southern Cone and beyond. Such routings are circuitous and sometimes involve a change of airports in Buenos Aires. The Argentinean Government is now essentially getting exactly what it wanted. With Pluna’s demise Aerolineas no longer has to worry about a plucky little carrier form Uruguay flying passengers between Argentina and Brazil. While Aerolineas only serves three destinations in Brazil, its new partnership with Gol (the two carriers are now working on implementing a codeshare) will give Aerolineas access to all the Brazilian destinations previously served by Pluna and many more. The big loser will be the consumer as Argentina-Brazil fares will inevitably increase without the competitively priced one-stop product provided by Pluna and transit times between dozens of city pairs will increase. Unless Argentina changes its policy related to access at secondary cities for Uruguayan carriers (and other foreign carriers), it is hard to imagine a viable network carrier model for the Uruguayan market. Pluna learned its lesson the hard way. Leadgate was so desperate to expand Pluna’s Argentinean network it acquired in 2009 a majority stake in AeroVIP, a small Argentinean regional carrier that had ceased operations in 2004. Leadgate re-launched AeroVIP in late 2009 using one of Pluna’s CRJ900s. Mr Campiani expected AeroVIP, as an Argentinean carrier, would be able to operate some of the Argentina-Uruguay routes Pluna could not secure Argentinean authorisations to fly and would feed Pluna’s hub in Montevideo. But Argentinean authorities repeatedly thwarted attempts by AeroVIP to secure authorisations required to operate scheduled services, forcing the carrier to only operate charters. After one year a frustrated Mr Campiani shut AeroVIP down and wrote off Leadgate’s investment in the carrier. In addition to opening several routes connecting regional cities in Argentina with Pluna’s Montevideo hub, Leadgate had ambitions to use AeroVIP to open point-to-point international routes. Mr Campiani viewed AeroVIP as the first component of an ambitious long-term plan to build a portfolio of regional carriers in South America, focusing on fast-growing but under-served markets under the radar screen of the region’s large airline groups. But that plan was placed on the backburner after the failure in Argentina, the most important market to Leadgate's broader regional airline group strategy, with AeroVIP. Mr Campiani recognised the tremendous opportunities that exist in Argentina’s under-served regional cities and the broader Argentinean market, where fares are high due to the lack of LCCs, but gradually realised the Argentina Government would simply not open up the market under any scenario. “The problem is really Argentina,” Mr Campiani told CAPA and Airline Leader last year. “The rest of the other countries are flexible and are opening,” he added, pointing specifically to Paraguay and Chile. Even without access to Argentina except to the country’s two biggest cities (Cordoba and Buenos Aires), Pluna was able to steadily improve its financial situation and come close to breaking even in the fiscal year ending Jun-2011. But the carrier was never well capitalised and after market conditions soured in late 2011 and early 2012, Pluna started to quickly run out of cash. December to April had been a profitable period for Pluna in recent years, as it is the high season for travel to and from Uruguay, but that wasn’t the case this year. Just two weeks prior to resigning as Pluna’s CEO and handing back Leadgate’s stake in Pluna to the Uruguayan government, Mr Campiani warned in a 04-Jun-2012 letter to employees that traffic in Argentina has fallen significantly since Nov-2011 after new currency control policies were implemented that require citizens to obtain government approval to buy US dollars. The policies also created challenges for Pluna to transfer funds from Argentina, one of its biggest origin markets, to Uruguay. Perhaps fittingly, a new Argentinean government policy drove the nail into Pluna’s coffin. While the business model Mr Campiani implemented at Pluna turned out to have a fatal flaw – reliance on the Argentinean market – the carrier under Leadgate had many notable accomplishments that quickly gained respect in the industry. In Nov-2010 Mr Campiani received the prestigious Frederico Bloch Award from Latin American Airline Association ALTA. The annual award, which recognises outstanding leadership in advancing commercial aviation in Latin America, has an impressive list of past awardees including Azul chairman David Neeleman, Volaris CEO Enrique Beltranena, Copa CEO Pedro Heilbron, former Embraer CEO Mauricio Botelho, Gol chairman Constantino de Oliveira Junior and LATAM CEO Enrique Cueto. While Mr Campiani was recognised for turning around Pluna and being an advocate for liberalisation in South America, Pluna’s positioning was always seen as relatively vulnerable. The day after receiving the Fredericho Bloch Award as part of the 2010 ALTA Airline Leaders Forum, Mr Campiani participated in a CEO panel discussion with the CEOs of Aeromexico, Avianca-TACA, LAN and TAM in which he jokingly agreed to hold up a “for sale” sign. With the Avianca-Taca merger having already been completed earlier in 2010 and LAN and TAM having announced plans to merge two months prior to the ALTA event, Pluna was in an increasingly challenging position. Pluna accounted for only 0.5% of total capacity in the South American market, which is now dominated by new LAN-TAM parent LATAM with about a 33% capacity share. 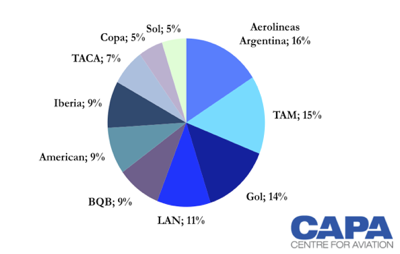 About 82% of capacity in the region, including capacity provided by foreign carriers, is now in the hands of South America's five biggest airline groups: LATAM, Avianca-Taca, Gol-Webjet, Azul-TRIP and Aerolineas Argentinas. Leadgate thought the best response to consolidation sweeping the industry would be to partner with some of South America’s giants, believing Pluna’s regional carrier business model and use of small aircraft could complement the larger carriers. Pluna built up a successful partnership with TAM but attempts to work with LAN repeatedly failed. As a result Pluna faced the prospect of losing its valuable codeshare with TAM and TAM Paraguay during the upcoming implementation process of the LAN-TAM merger. Pluna had tried to talk with TAM rival Gol about a potential codeshare but Gol was not interested. Mr Campiani also approached several of South America’s bigger carriers to offer Pluna capacity in markets outside Uruguay as a regional feeder. Mr Campiani thought there could be a niche in South America following the regional carrier model used in North America, where regional carriers operate routes on behalf of the major carriers through capacity purchase agreements (CPA). Pluna considered adding smaller 50-seat regional jets for potential CPA customers but never acquired the aircraft as there was little to no interest in its CPA proposition. While most major carriers in South America do not have any aircraft with less than 100 seats in their fleets, they did not see the value of regional aircraft through a partnership with a regional jet operator like Pluna. Mr Campiani also looked at opportunities for Pluna-branded non-Uruguayan flying, with the carrier operating at one point some fifth-freedom international routes such as Asuncion-Santiago. Pluna also took a couple of stabs at operating a domestic route in Chile. From both a business model and networks standpoint, Mr Campiani was eager to try new things and identify new niches under the radar screen of the region’s large airline groups. While there were some successes along the way, the setbacks were more frequent. So when push came to shove, Mr Campiani made the difficult but correct decision on 15-Jun-2012 to resign and pull out of Pluna rather than inject new capital. Over the five years it owned a majority stake in Pluna, Leadgate invested a total of about USD30 million. As a turnaround specialist which in the 2004 to 2007 timeframe acquired, restructured and sold for a profit Uruguayan dairy company Parmalat, Leadgate entered Pluna with a clear strategy of turning around the flag carrier and ultimately exiting through the sale to a new investor. Shortly after starting the turnaround effort at Pluna, Leadgate began to hunt for new investors to assume a minority stake and help cover another capital infusion. Leadgate’s preference was to bring in another airline as a strategic investor with the idea that the other carrier would provide expertise in further restructuring Pluna and potentially take over the carrier entirely. Mr Campiani’s pursuit of a strategic investor ended successfully in early 2010, when Canadian regional carrier Jazz (now known as Chorus Aviation) agreed to take a 25% indirect stake in the company for USD15 million as part of a recapitalisation. At the same time Leadgate reduced its stake in Pluna to an indirect 50%. Pluna remained 25% government owned with the majority 75% stake transferring from Leadgate to Latin American Regional Aviation Holdings, which in turn was 33% owned by Chorus and 67% owned by Leadgate. Chorus had the option of buying out the Leadgate stake after Leadgate decided on 15-Jun-2012 to exit but Chorus reportedly declined, deciding that it was best to follow Leadgate in pulling out of Pluna and forfeiting its investment. The Government subsequently looked for new investors willing to pump in new capital and become the new majority owner. But there were no takers – hardly surprising given Pluna’s huge debt load, which is reportedly about USD380 million, and the carrier’s ultimate failure under Leadgate to find a profitable niche. With the Government also unwilling to pump in capital and reassume full control, Pluna had no choice but to cease operations on 05-Jul-2012. Given the small size of Uruguay, the ninth largest aviation market in South America, Pluna will be quickly forgotten. Other carriers, led by Pluna’s nemesis Aerolineas Argentinas, will quickly fill the void. Leadgate and Mr Campiani will move on to new and better things. Pluna for a while made all the right moves as it tried to adapt to changing market conditions by becoming the first and only carrier in Latin America to pursue a hybrid model. Its innovative model and network initially appeared to be successful, providing a glimmer of hope for other small carriers in South America and beyond seeking new alternatives to ensure their survival. But in the end Pluna succumbed, a victim in a market that remains highly regulated and has become increasingly challenging for smaller carriers.